Cyanotoxins are a group of organic compounds biosynthesized intracellularly by many species of cyanobacteria found in surface water. The United States Environmental Protection Agency has listed cyanotoxins on the Safe Drinking Water Act's Contaminant Candidate List 3 for consideration for future regulation to protect public health. Cyanotoxins also pose a risk to humans and other organisms in a variety of other exposure scenarios. Accurate and precise analytical measurements of cyanotoxins are critical to the evaluation of concentrations in surface water to address the human health and ecosystem effects. A common approach to total cyanotoxin measurement involves cell membrane disruption to release the cyanotoxins to the dissolved phase followed by filtration to remove cellular debris. Several methods have been used historically, however no standard protocols exist to ensure this process is consistent between laboratories before the dissolved phase is measured by an analytical technique for cyanotoxin identification and quantitation. No systematic evaluation has been conducted comparing the multiple laboratory sample processing techniques for physical disruption of cell membrane or cyanotoxins recovery. Surface water samples collected from lakes, reservoirs, and rivers containing mixed assemblages of organisms dominated by cyanobacteria, as well as laboratory cultures of species-specific cyanobacteria, were used as part of this study evaluating multiple laboratory cell-lysis techniques in partnership with the U.S. Environmental Protection Agency. Evaluated extraction techniques included boiling, autoclaving, sonication, chemical treatment, and freeze-thaw. Both treated and untreated samples were evaluated for cell membrane integrity microscopically via light, epifluorescence, and epifluorescence in the presence of a DNA stain. The DNA stain, which does not permeate live cells with intact membrane structures, was used as an indicator for cyanotoxin release into the dissolved phase. Of the five techniques, sonication (at 70 percent) was most effective at complete cell destruction while QuikLyse™ was least effective. Autoclaving, boiling, and sequential freeze-thaw were moderately effective in physical destruction of colonies and filaments. 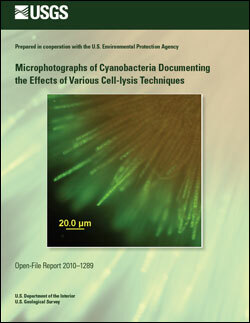 Rosen, B.H., Loftin, K.A., Smith, C.E., Lane, R.F., and Keydel, S.P., 2010, Microphotographs of cyanobacteria documenting the effects of various cell-lysis techniques: U.S. Geological Survey Open-File Report, 2010–1289, 203 p.